The University of Central Oklahoma’s pom team danced its way to a national championship at the Universal Cheerleaders Association (UCA) and Universal Dance Association (UDA) College Cheerleading and Dance Team National Championship, Jan. 18-20 in Orlando, Florida. The team placed first in the Open Game Day Division and sixth in the Open Jazz Division. The UCA and UDA College Cheerleading and Dance Team National Championship is the most prestigious college cheerleading championship in the country with teams from all 50 states competing. “Words can't express how proud I am of every individual on this team,” said Lil Doescher, UCO pom team head coach. · Landry Willis, a sophomore kinesiology major. “We are proud to represent our school and receive a national championship in the Game Day Competition, a first for UCO Pom,” said Kassan. In addition to the pom team’s success, Central’s cheer team placed fifth in the Open Game Day Division. For more information about Central’s cheer and pom teams, visit www.uco.edu/spirit. 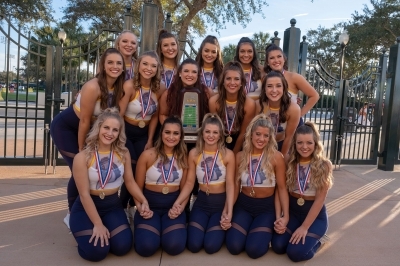 Cutline: The University of Central Oklahoma’s pom team placed first in the Open Game Day Division and sixth in the Open Jazz Division traveled at the Universal Cheerleaders Association and Universal Dance Association College Cheerleading and Dance Team National Championship, Jan. 18-20 in Orlando, Florida. Pictured top to bottom, left to right Emma Schnautz, Kaitlyn Tinsley, Peyton Kuykendall, Bre Sanders, Katie Hurley, Kara Mickle, Baylee Mays, Breanne Kassan, Sidney Bowmaker, Kayla Tinsley Madi Grimes, Brooklyn Henry, Nicole Traxler, Jaidyn Walker and Landry Willis.